Charles Matthew Getty was born July 24, 1952 in Pompton Lakes. Tall, quick and powerful, CHarlie was a standout in football from a young age. While attending Pompton Lakes High School, he earned all-state honors as a football lineman, wrestler and member of the track team. Charlie was recruited to Penn State on a dual football-wrestling scholarship. 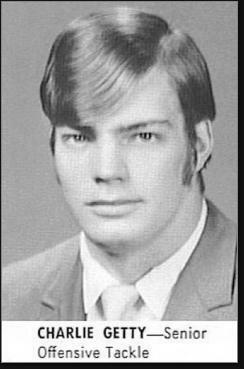 In 1973, the Nittany Lions went undefeated and he earned All-America recognition. In his final game, Charlie was part of the Orange Bowl team that turned a 13–3 halftime deficit against LSU into a stunning 35–13 victory. The following spring, he finished third in the NCAA championships as a wrestler. Charlie was one of the top offensive linemen in the 1974 draft. He was the fifth tackle taken, going in the second round to the Kansas City Chiefs. Charlie started all 14 games at left tackle and was named to the NFL’s All-Rookie team. He played left guard, right guard and right tackle for the Chiefs over the next nine seasons, mostly as a starter. The only year his struggled with an injury was 1980. The Chiefs had just winning season while Charlie was with the club. He spent his final season as a pro with the Green Bay Packers in 1983. Charlie remained active with the Chiefs after retirement as par tof their Ambassadors community service group. For the better part of 20 years, he worked as a phys ed teacher and coach in high schools around Missouri. In 2002, Charlie joined the Kinesiology Department at Evangel University in Springfield, Missouri, and served as strength and conditioning coach for a number the school’s team in the years that followed—turning down coaching and scouting offers from his old NFL buddies. He also coached the offensive and defensive linemen on Crusaders football team.